To prep the ribs: Spread rub all over ribs and massage in with your hands. Wrap in foil or plastic wrap on a baking sheet and let sit overnight in the refrigerator. To make the honey bourbon BBQ sauce: Place all sauce ingredients into a medium saucepan over medium heat. Cook over medium heat, stirring occasionally, until sauce has reduced by about one quarter. This will take about 30 minutes. Let cool. Place sauce in a high-powered blender and blend until well combined and smooth. 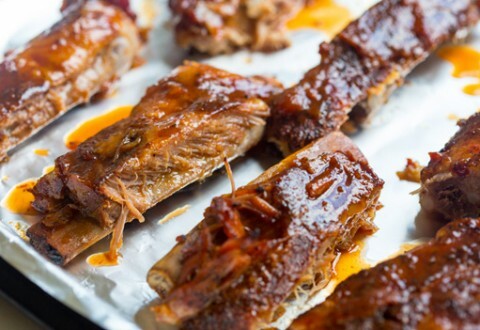 To cook the spare ribs: Place spare ribs in slow cooker. Slather with about half of the BBQ sauce. Cook on low for 8-9 hours, or on high for 4-5 hours. Once cooked, carefully remove the ribs from slow cooker and place on foil-lined (for easier clean up) baking sheet. Heat oven to 400 F. Slather ribs with more of the BBQ sauce and cook for 10-15 minutes in oven until slightly crispy on the edges. Serve immediately with remaining BBQ sauce.